Mongolian Sunday is a striking horse, even better looking in person than in his pictures, which were taken right after he emerged from the wash rack on a steamy day, and when he was trying to get away from the bees and flies that were out in force on a very hot and humid morning. 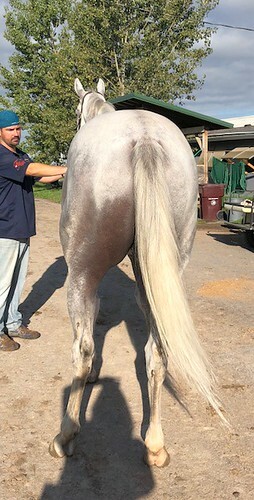 His handler offered that Sunday has a “puppy dog” friendly personality and wonderful ground manners. Despite the muggy conditions and buzzing bees, Sunday was indeed a very well behaved gentleman. 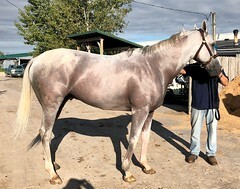 We admired his solid body, regal presence, and big, ground covering stride at the jog. 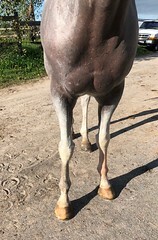 He is a very nice mover! His trainer says that he is sound, has no vices, and is running competitively at the allowance level, but he wants to start trying to find him a new non-racing home so that he can reduce his stable size as the end of the meet approaches — and because he fully recognizes Sunday’s extraordinary potential to excel in a new career as a show hunter or eventer. Mongolian Sunday is by the same sire — Any Given Saturday — and was originally owned by the same owner as Mongolian Saturday, a multiple graded stakes winner, notably of the 2015 Breeders Cup Turf Sprint. 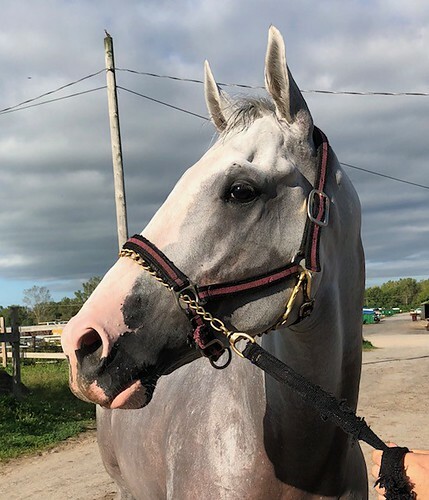 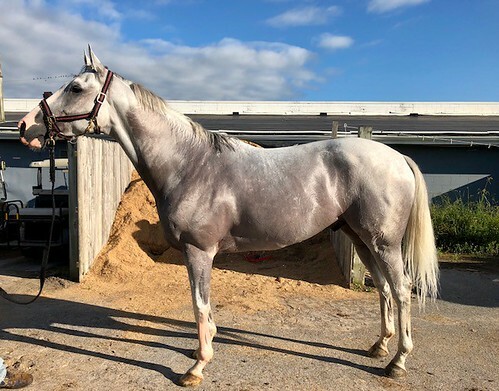 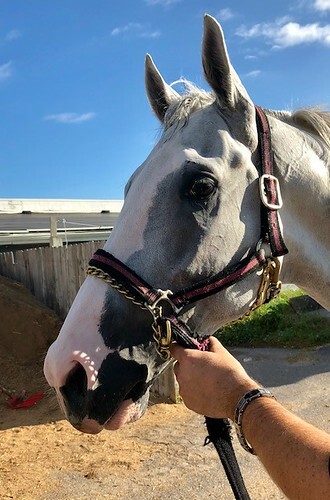 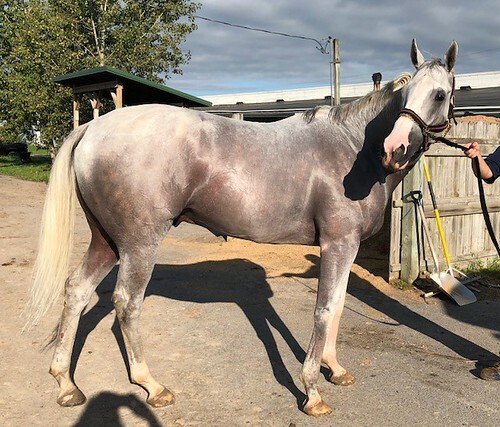 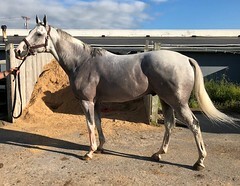 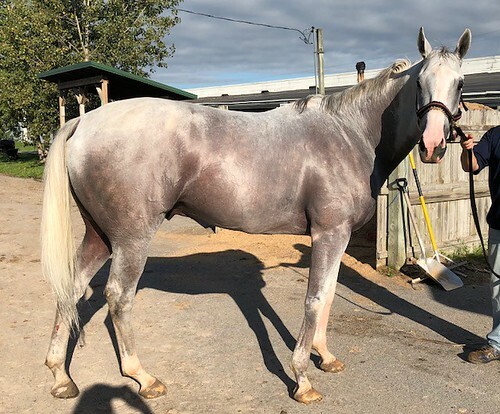 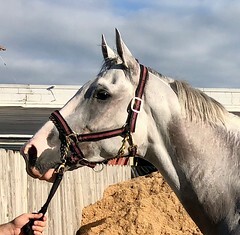 His owner/trainer has put a big price on him because he is willing to retain him for racing next year and he knows his value for both racing and sporting careers. His sire, Any Given Saturday, is by Distorted Humor out of an AP Indy mare, and we have placed several of his offspring who are succeeding in new disciplines ranging from hunters to dressage to eventing. Sunday’s dam is by El Prado, from the Sadler’s Wells and Sir Ivor sire lines, so his pedigree is certainly a good one for jumping disciplines.